Co. Sligo: Aughris, Buncrowey, East Castleconor, West Castleconor, East Dromard, West Dromard, Dromore West, East Easky, West Easky, Kilglass, Mullagharuse, Rathmacurkey, Skreen, North Templeboy, South Templeboy, East Toberpatrick, West Toberpatrick. The Dromore West Board of Guardians met each week on Tuesday. The new Dromore West Board of Guardians originally proposed to avoid the expense of building a workhouse by making use of a building in Sligo town, and to pay the Sligo Union a weekly rate for each pauper accommodated. However, they were unable to agree on the rate so a Dromore West Union workhouse was erected in 1850-52 on a six-acre site to the west of Dromore West. Designed by the Poor Law Commissioners' architect George Wilkinson, the building was based on one of his standard plans to accommodate 400 inmates. Its construction cost £4,650 plus £815 for fittings etc. The Board demanded that were of the cheapest most durable nature with "all mere decoration studiously avoided". The workhouse site location and layout are shown on the 1910 OS map below. Dromore West workhouse site, 1910. The workhouse design was somewhat different to Wilkinson's earlier plans, and was a similar size and layout to workhouses such as those at Tubbercurry and Glenamaddy which were built at around the same time. The entrance at the north was flanked by two two-storey blocks which included school rooms and accommodation for boys and girls. Dromore West from the north-west, 2003. 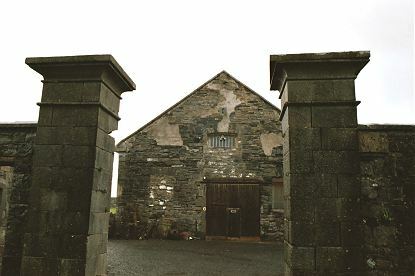 Dromore West entrance from the north, 2003. To the rear, the main buildings had a T-shaped layout. The central wing running northwards was probably a single-storey block containing the kitchen and dining-hall which also served as a chapel. A large cast iron cooking pot and weighing scales survive from the 1840s. 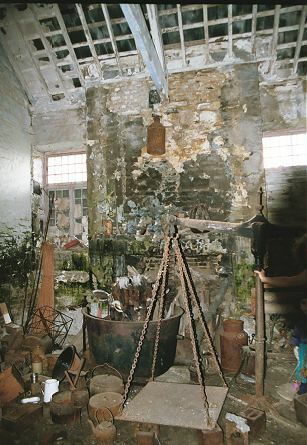 Dromore West kitchen/dining-hall interior, 2003. To each side were accommodation wings and yards — one for men and one for women. An outbuilding at the north may have been a laundry block. 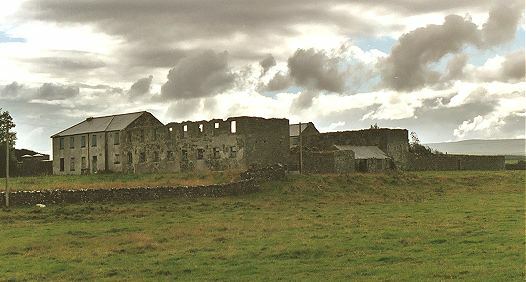 Dromore West central spine, accommodation wing and outbuildings, 2003. To the rear was a small building said to be a well-house. Dromore West rear of accommodation block and well-house from the south-west, 2003. A hospital block lay at the south of the site, with the workhouse cemetery to the south-west. 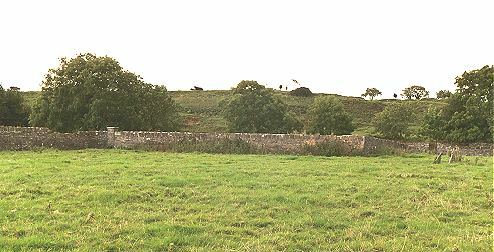 Dromore West cemetery from the north-east, 2003. The cemetery wall contains a memorial stone for those buried there. 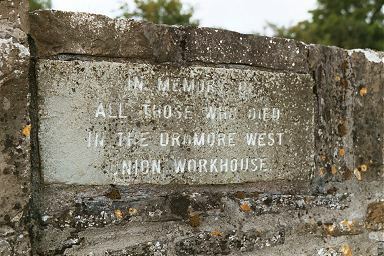 Dromore West memorial stone, 2003. Dromore West from the cemetery, 2003. The Union Workhouses in this County, as well as those elsewhere, sorely need the closest supervision, which we regret to find they fail to obtain. If official eyes were kept unclosed many disreputable acts, which from time to time obtained publicity, would never have occurred. A very lamentable case has just been presented to our notice, the facts of which are calculated to shock the feeling of all who are not wedded to mental depravity. A young girl, whose years do not count a score, held in the Workhouse of Dromore West a respectable and responsible position. Laxity of discipline permitted unrestricted ingress, and egress, to a viciously disposed youth, and the lamentable result is that this poor girl has been ruined, which term comprises the destruction of her reputation as well as the blighting of her prospects in life; the preservation of the former, and the success of the latter being wholly dependent on the strict adherence to virtuous principles. On last Sunday the officiating clergyman baptized an infant, which was named at the font Emma Hale, and this child of ignominy, and her youthful mother are at this moment paupers, inmates of the Dromore West Workhouse. The paternity of this child of shame is imputed to the son of the Chairman of the Board of Guardians. The Matron of the Workhouse is the niece of this dignitary, and Mahon, the medical officer, is his son-in-law. With so many relatives in high office in this model institution, the graceless character who is charged with this young girl's fall did not want for opportunities to accomplish his foul purposes. If we are not misinformed, and we do not apprehend such is the case, drinking and card-playing were carried on rather frequently in some of the officers' apartments. Whenever immoderate drinking is indulged in, iniquitous results may be fully expected to intervene. At the end of 1920, the Union was in a finacial crisis after its rate collectors were repeatedly ambushed by the IRA to help finance its War of Independence. In January 1921, workhouse staff had been without pay for six months and clothing, bedding and other items were being comandeered by IRA troops. In 1923, the workhouse was burnt out by local anti-treaty IRA to prevent its use by the Black and Tans. The remaining inmates were transported on carts to St John's and the Nazareth House in Sligo. 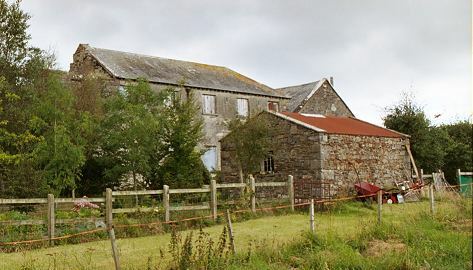 The workhouse buildings were later used for a variety of purposes including a dance-hall, a court-house, and for the storage of various agricultural materials including guano (bird manure used as fertiliser). The surviving workhouse buildings were converted to residential use in the 1980s. The present owners, artists Cilliam Rogers and Imelda Peppard, hope to continue to restore the fabric of the surviving parts of this historic building. National Archives of Ireland, Bishop Street, Dublin 8. Holds Board of Guardians' minute books and other papers.